Three user-definable workspaces per monitor, each with discrete split-screen controls and frame management. Additionally, single- or multiple-screen snapshots allow instant reconfiguration. Channel Faders - Not just any channel faders - true LTP channel faders that you can use for simple shows directly or to build up looks for use as submasters or cues, or to actually edit levels stored in subs or cues live. 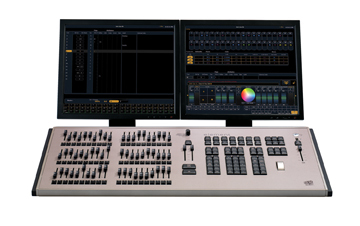 Submasters - Turn a switch, and your channel faders become 40 Submasters for simple playback of live shows. Need subs all the time? The Element 60 provides 20 dedicated submaster faders in addition to the 40 switchable channel/submaster faders. Cue List - Record cues and fade times into Element's cue list for simple playback of more complex shows using a Go button. When you're ready, use more complex timing functions like cue parts and follows to create more intricate lighting transitions. Effects - Record effects directly into cues or load them into Submasters for even more dynamic lighting looks. 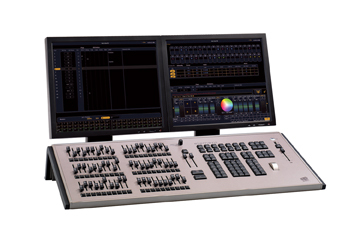 Accessory, LED and moving-light controls - At the press of a button, the ML Controls appear on screen with tools designed to control smaller numbers of non-intensity equipment like scrollers, gobo rotators and mirror heads for conventional fixtures. Color and Gel Picker tools let you apply just the right color to LEDs and color-mixing accessories and fixtures. Intensity, Focus, Color and Beam Palettes let you store commonly-used settings to buttons you can label yourself. Fully synchronized backup (and a second programming surface) through another Element, ETCnomad™ or ETCnomad Puck™. Data-laundering from Obsession™, Express™, Expression®, Emphasis®, Congo®, Cobalt™, Transtechnik NT, Avab VLC, Grand MA1, Grand MA2 and Strand 500/300 series show files.